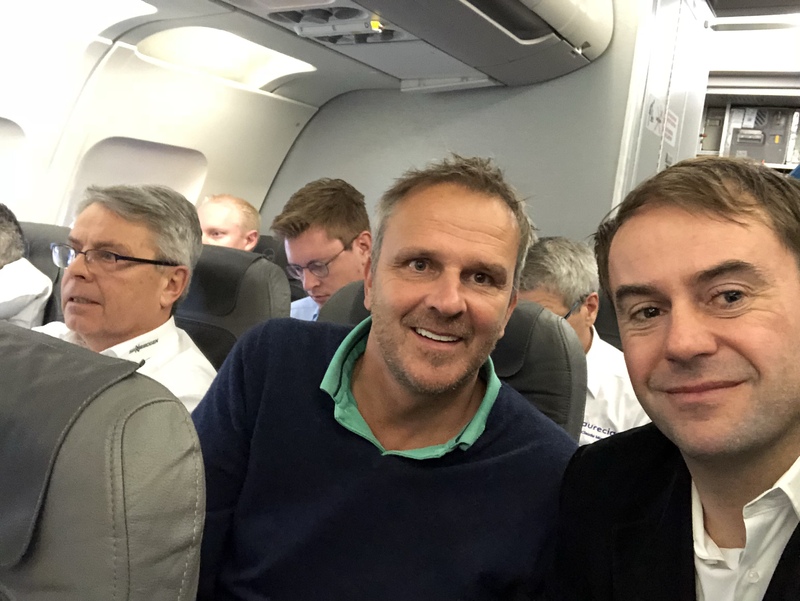 I was on the same flight as the German national team out of Russia and am now following the World Cup action too in front of the TV. Of course, the tournament still interests me. I must admit that as the Germans are out of the tournament, I’m supporting the English team. The “Three Lions” not only won against Falcao and Co, they also broke their penalty curse (apologies to England: Against Germany, that wouldn’t have happened for sure… ;-)). Brazil is already out. So: Come on, England! Before the tournament, Didi and me, we thought that England is going to have a big role in this tournament. That for, we were in England together before the World Cup. 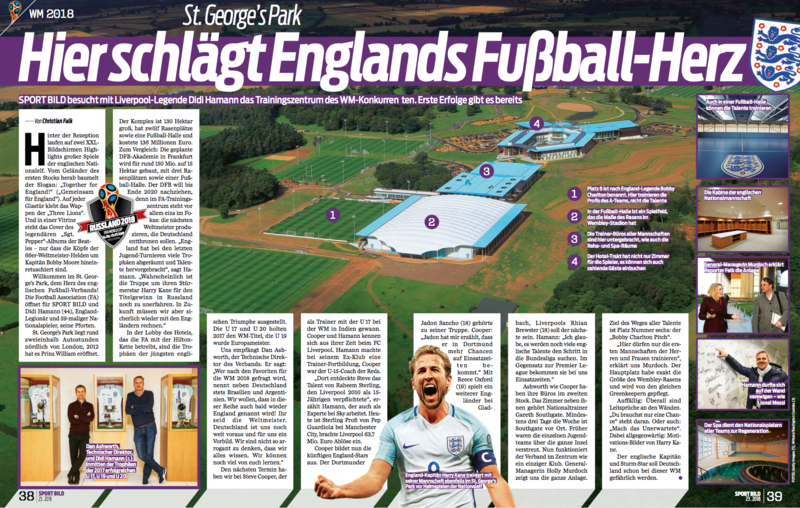 Two hours by car, north from London: for a visit to the St. George’s Park, the Englisch training-center. Behind reception are two big monitors, showing highlights of England’s greatest matches. On the first floor, there is a massive slogan: “Together for England! “. On every door you find the “Three Lions” emblem. And locked in a cabinet is the famous cover of the legendary Beatles album –“Sgt. Pepper”. 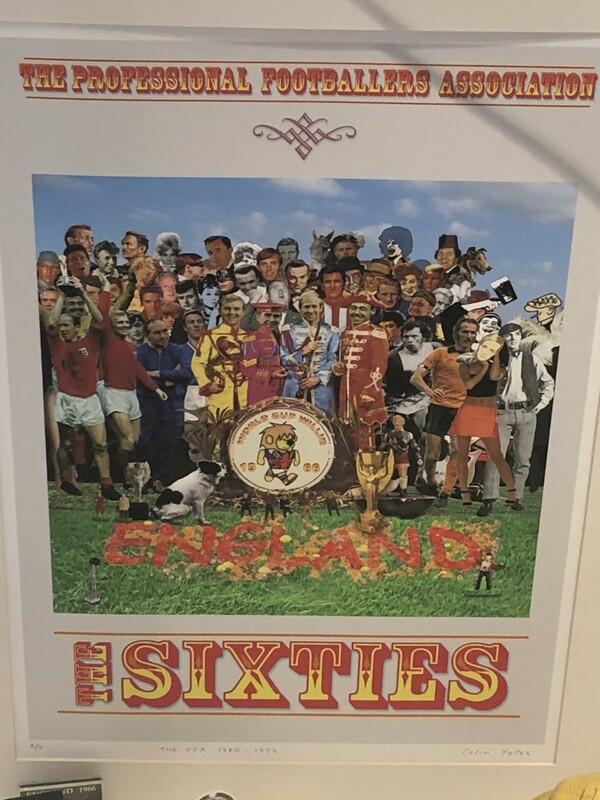 The only slight difference is that it shows the 1966 World Cup winners with captain Sir Bobby Moore. 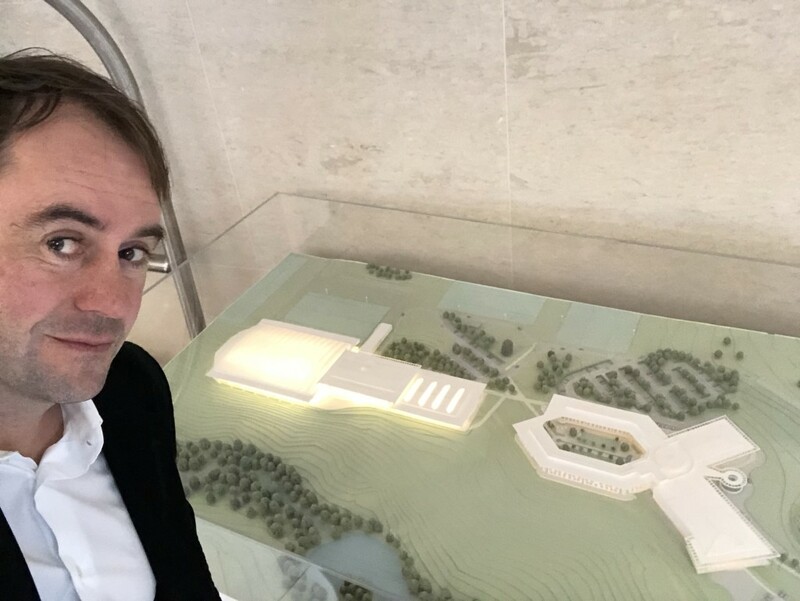 Welcome to St. George’s Park, the heart of the English Football Association! The FA welcomed us very nice. 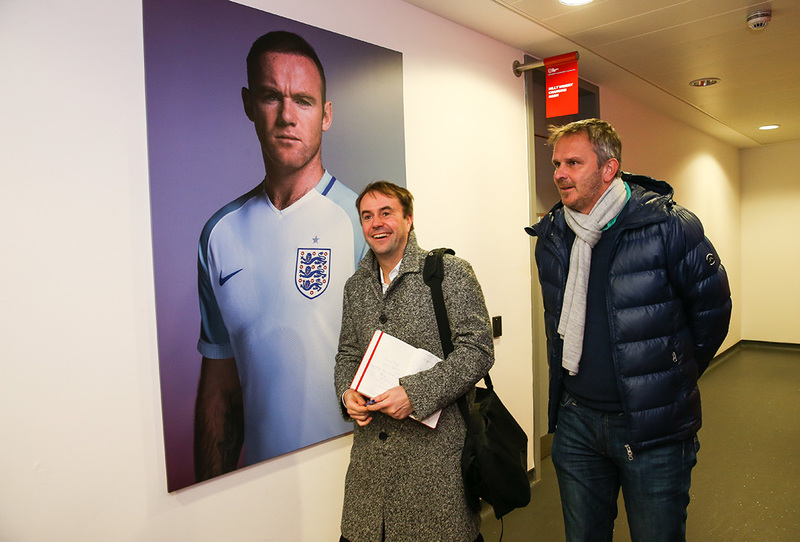 Andy Walker, the manager of communication of the association, prepared an exclusive tour through the St. George’s Park. That since we met Dan Ashworth, Technical Director of the association and director of the St. George’s Park, U-17-coach Steve Cooper (current World Champion) and GM Holly Murdoch. An area with over 130 hectares, 12 fields, the football-hall, the spa, the canteen and the dressing room – they showed us everything! 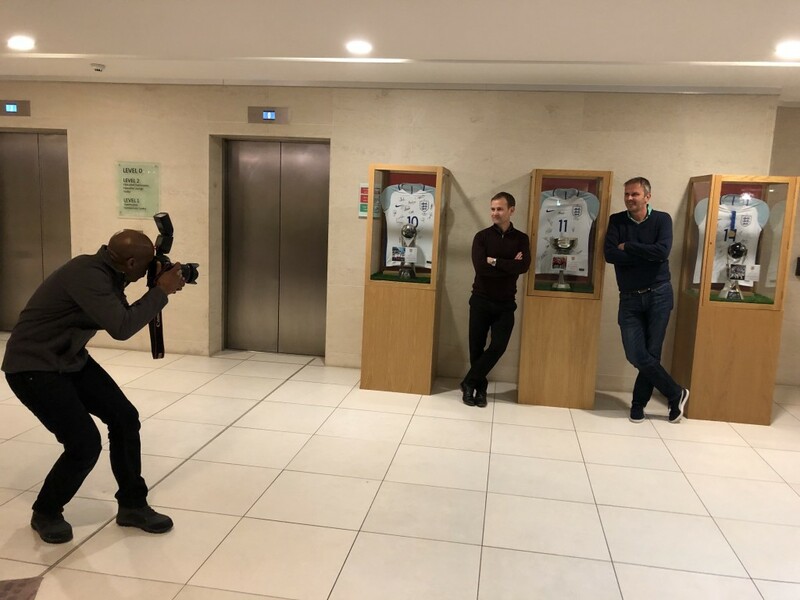 In the lobby, which is used by both the FA and the Hilton are England’s most recent trophies. The youth teams, the U-17 and the U-20 won the World Cup in 2017 and the English U-19 became European Champions. Before the quarterfinals I wrote to Andy Walker again and wished him all the best for the rest of the tournament. I stress that Didi and I would like another visit and maybe, next time, there will be another trophy – a golden one. Andy replies with two crossed fingers. England hopes to win its first title since 1966 (at the moment, their opponent in the final escapes me). I sing with Mané Mané!